If you’re not very traditional, all bets are off. You can ask who you want. Traditionally speeches are held in the reception room. 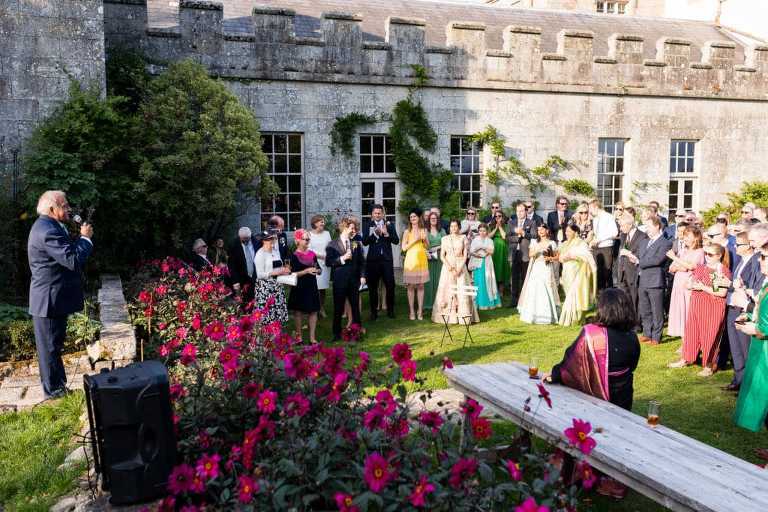 However, more couples are doing thing their own way and opting for speeches in a more casual setting like a drawing room or outdoors if it’s a sunny day. My concern for speeches is always available light so keep this in mind when choosing where to have your speeches. I’m a big fan of speeches before the meal. The main reason being that the speakers can get it done and enjoy their dinner. If you have them after, the majority of speakers I’ve seen spend the meal rehearsing and they don’t enjoy the meal. If you’re opting to have them before the meal, you’ll have to adjust your timeline accordingly. Talk to your venue about working that bit out. Top tip: give your speakers a time limit to prevent speeches from running way over. The majority of venues prefer speeches after the meal. This takes the pressure off the kitchen and provides a definite end to the dinner part of the reception. Although it might seem like a great idea, speeches in between each course is a nightmare to document. There’s staff everywhere, photographers and videographers in their way and the noise from them collecting your empty plates will be picked up on video. Stick to either before or after the meal. I hope you found this helpful, if you know someone else who might find it interesting feel free to share. If you’ve any questions about how to plan your wedding speeches or anything else wedding related feel free to get in touch.